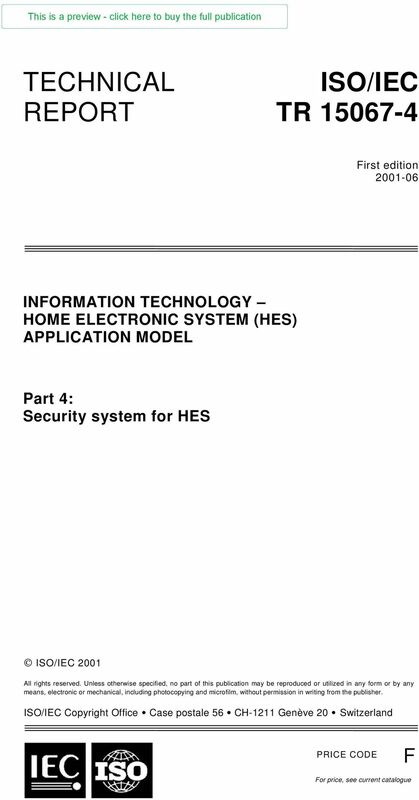 Download "This is a preview - click here to buy the full publication TECHNICAL REPORT INFORMATION TECHNOLOGY HOME ELECTRONIC SYSTEM (HES) APPLICATION MODEL"
3 TR ISO/IEC:2001(E) 3 INFORMATION TECHNOLOGY HOME ELECTRONIC SYSTEM (HES) APPLICATION MODEL Part 4: Security system for HES FOREWORD 1) ISO (International Organization for Standardization) and IEC (International Electrotechnical Commission) form the specialized system for worldwide standardization. National bodies that are members of ISO or IEC participate in the development of International Standards through technical committees established by the respective organization to deal with particular fields of technical activity. ISO and IEC technical committees collaborate in fields of mutual interest. Other international organizations, governmental and non-governmental, in liaison with ISO and IEC, also take part in the work. 2) In the field of information technology, ISO and IEC have established a joint technical committee, ISO/IEC JTC 1. Draft International Standards adopted by the joint technical committee are circulated to national bodies for voting. Publication as an International Standard requires approval by at least 75 % of the national bodies casting a vote. 3) Attention is drawn to the possibility that some of the elements of this Technical Report may be the subject of patent rights. ISO and IEC shall not be held responsible for identifying any or all such patent rights. The main task of IEC and ISO technical committees is to prepare International Standards. In exceptional circumstances, a technical committee may propose the publication of a technical report of one of the following types: type 1, when the required support cannot be obtained for the publication of an International Standard, despite repeated efforts; type 2, when the subject is still under technical development or where, for any other reason, there is the future but not immediate possibility of an agreement on an International Standard; type 3, when the technical committee has collected data of a different kind from that which is normally published as an International Standard, for example state of the art. Technical reports of types 1 and 2 are subject to review within three years of publication to decide whether they can be transformed into International Standards. Technical reports of type 3 do not necessarily have to be reviewed until the data they provide are considered to be no longer valid or useful. 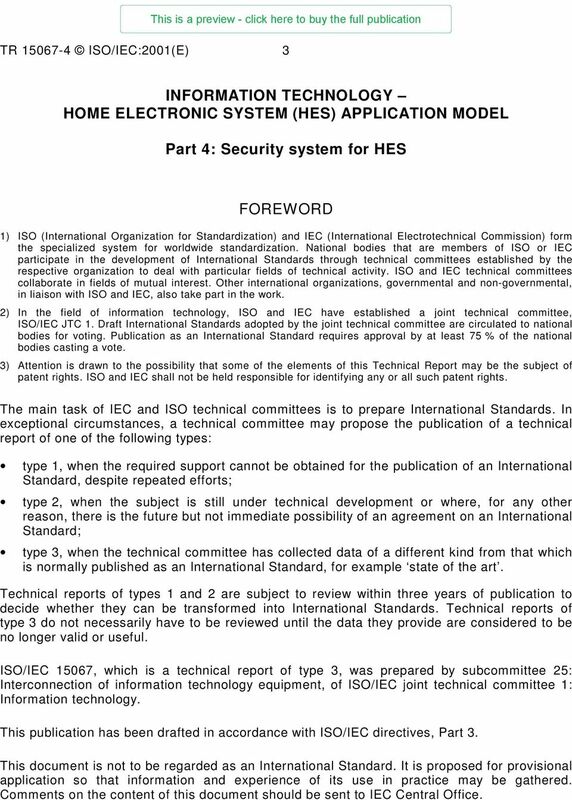 ISO/IEC 15067, which is a technical report of type 3, was prepared by subcommittee 25: Interconnection of information technology equipment, of ISO/IEC joint technical committee 1: Information technology. This publication has been drafted in accordance with ISO/IEC directives, Part 3. This document is not to be regarded as an International Standard. It is proposed for provisional application so that information and experience of its use in practice may be gathered. Comments on the content of this document should be sent to IEC Central Office. 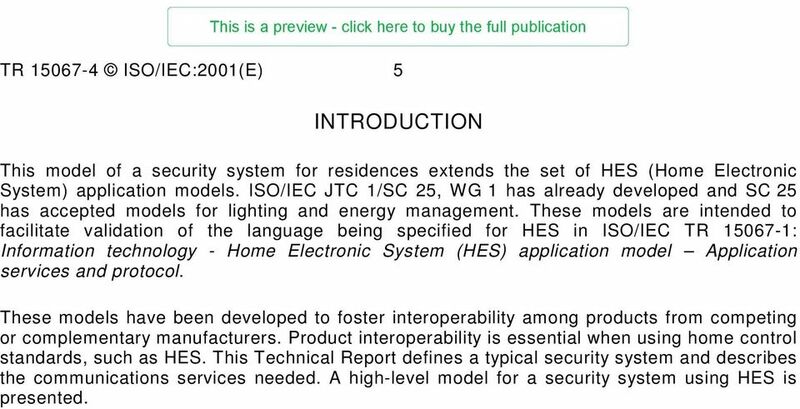 5 TR ISO/IEC:2001(E) 5 INTRODUCTION This model of a security system for residences extends the set of HES (Home Electronic System) application models. ISO/IEC JTC 1/SC 25, WG 1 has already developed and SC 25 has accepted models for lighting and energy management. These models are intended to facilitate validation of the language being specified for HES in ISO/IEC TR : Information technology - Home Electronic System (HES) application model Application services and protocol. These models have been developed to foster interoperability among products from competing or complementary manufacturers. Product interoperability is essential when using home control standards, such as HES. This Technical Report defines a typical security system and describes the communications services needed. A high-level model for a security system using HES is presented. 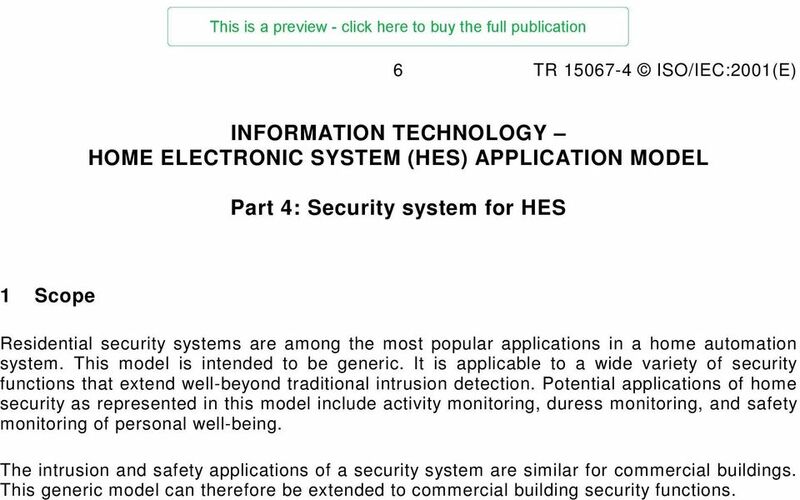 6 6 TR ISO/IEC:2001(E) INFORMATION TECHNOLOGY HOME ELECTRONIC SYSTEM (HES) APPLICATION MODEL Part 4: Security system for HES 1 Scope Residential security systems are among the most popular applications in a home automation system. This model is intended to be generic. It is applicable to a wide variety of security functions that extend well-beyond traditional intrusion detection. Potential applications of home security as represented in this model include activity monitoring, duress monitoring, and safety monitoring of personal well-being. The intrusion and safety applications of a security system are similar for commercial buildings. This generic model can therefore be extended to commercial building security functions. 2 A typical security system 2.1 Modes of operation A modern security system provides more than detection of unauthorized entry into a building. The range of applications of a security system spans: Intrusion detection Sensor devices are installed to detect intrusion at particular locations in a building. The sensor types are described in Sensors are connected to a security controller that is programmed with various algorithms. When a sensor is armed and tripped, the controller may sound an audible alarm locally and/or may issue a notification to a remote site, for example via telephone. The activation of the controller and choice of algorithm depends on user inputs from one or more control panels (user interfaces) Restricted movement sensing Typically, this mode of operating a security system is chosen when the occupants are sleeping. Sensors at the perimeter of the house and in selected rooms are armed. Activity and movement in the bedroom will not trip the alarm. Therefore, one or more motion detectors in the bedroom and possibly some window sensors are not monitored. All other sensors are monitored as for intrusion detection Activity monitoring This is a relatively new application of a security system. The system is specifically programmed to alert a monitoring station or place a call to a family member upon the absence of internal motion. Examples where this scheme is used include: Elderly person monitoring The objective is to determine if the person is moving about the house while home. The absence of motion over a period of an hour or two when the person is not expected to be sleeping might indicate that the person needs help.